I also disfavour islands because the people who live on them tend to be a little odd; the smaller the island, the stranger folk seem. This means that the inhabitants of Australia and Greenland might be no more eccentric than their mainland counterparts. Yet, when it comes to the people of, say, Prince Edward Island (which is smaller even than Vancouver Island) … well, just look at Anne of Green Gables. Islands also require travel by boat, and I don’t like boats of any sort, not even 11,000-tonne, vehicle-capable ferries with electronic fin stabilizers, for I can feel the rolling motion of any vessel. My seasickness is renowned in four provinces! 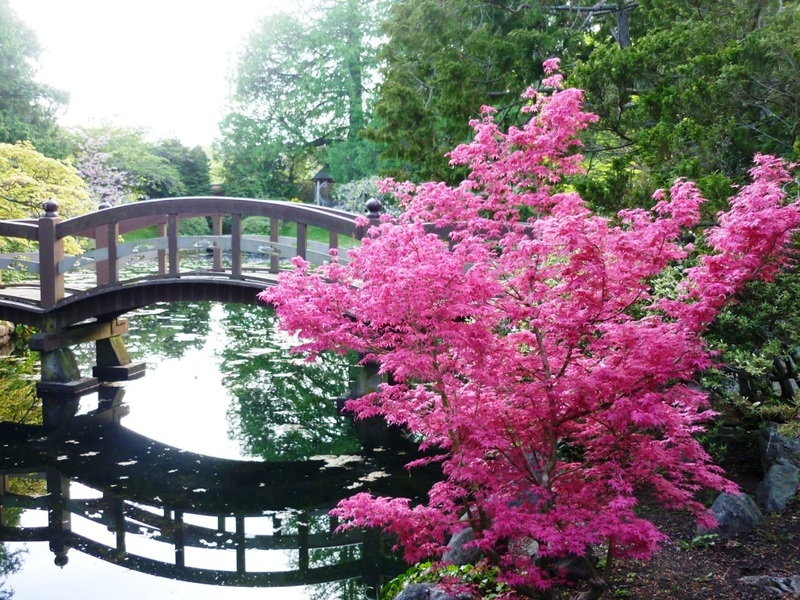 Shindeshojo Japanese Maple in the Japanese Garden at Royal Roads University. 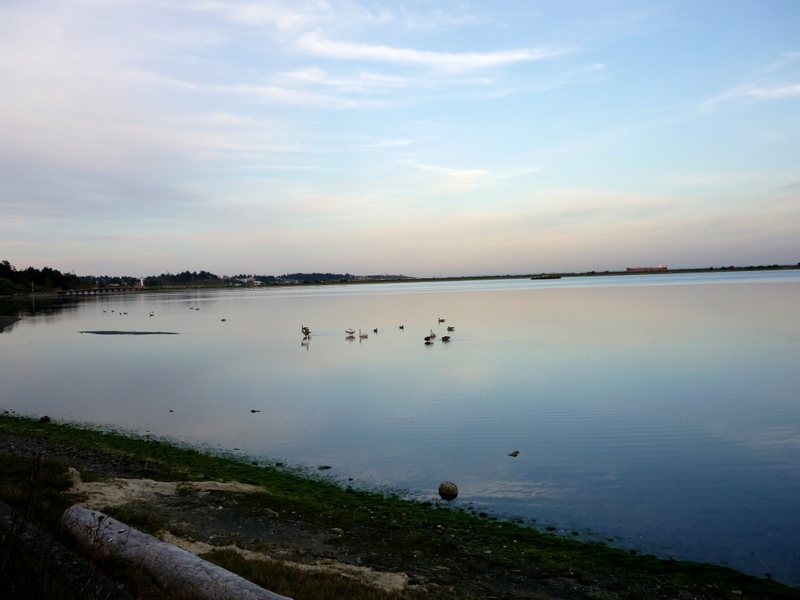 Esquimalt Lagoon, Royal Roads University. 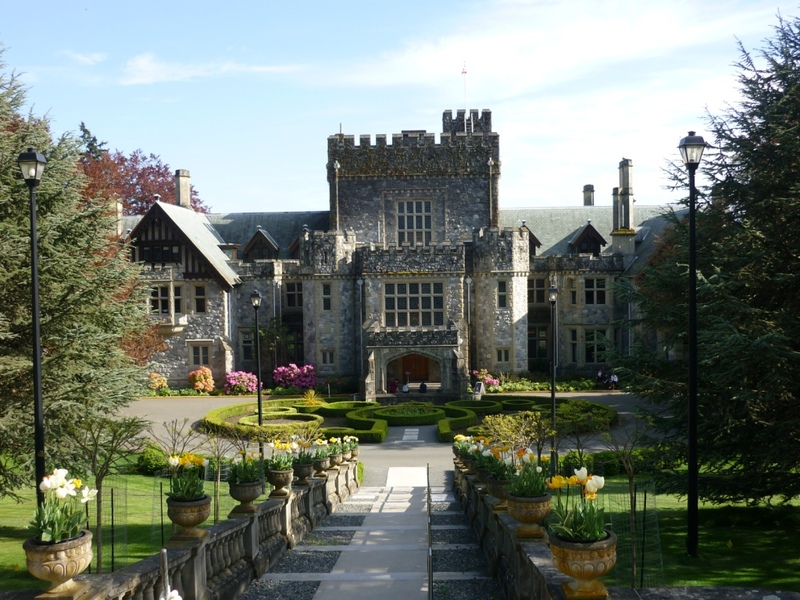 Hatley Castle, Royal Roads University. Royal Roads University Conference Centre. And that peacocks freely roam the campus. This last point is especially positive. 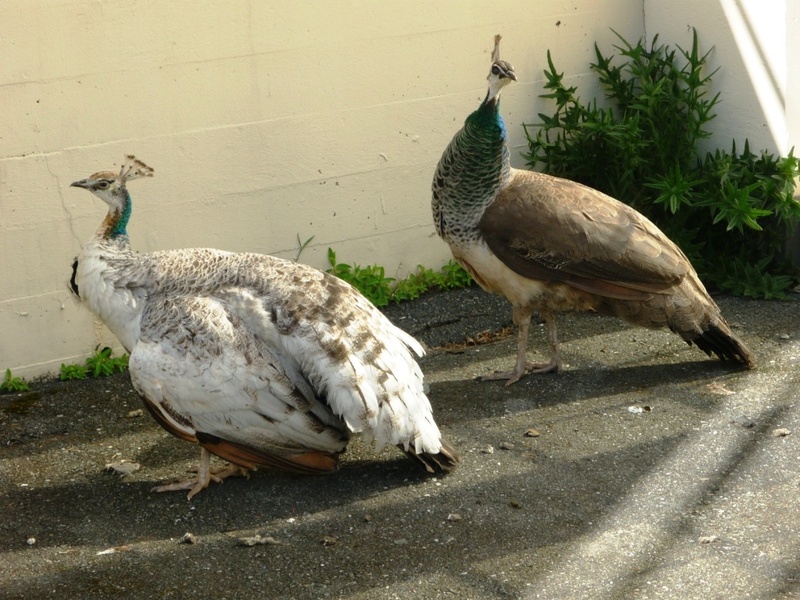 Female peacocks, Royal Roads University. 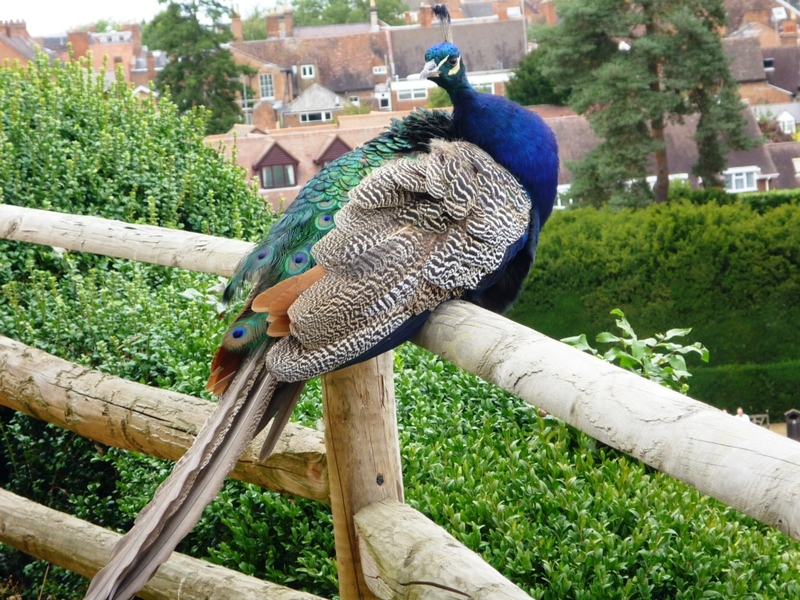 Male peacock, Warwick Castle, England, August 2011. 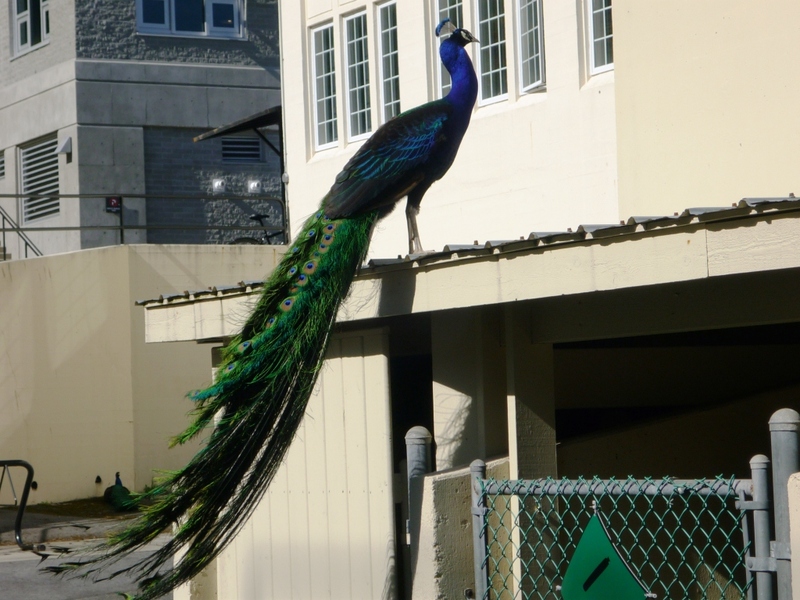 Male peacock, Royal Roads University, April 2014. The males can even still fly despite that train of tail feathers, as evidenced by my observing a male pursue two females roosting in a tree. For every branch the females ascended to evade him, he casually followed suit. 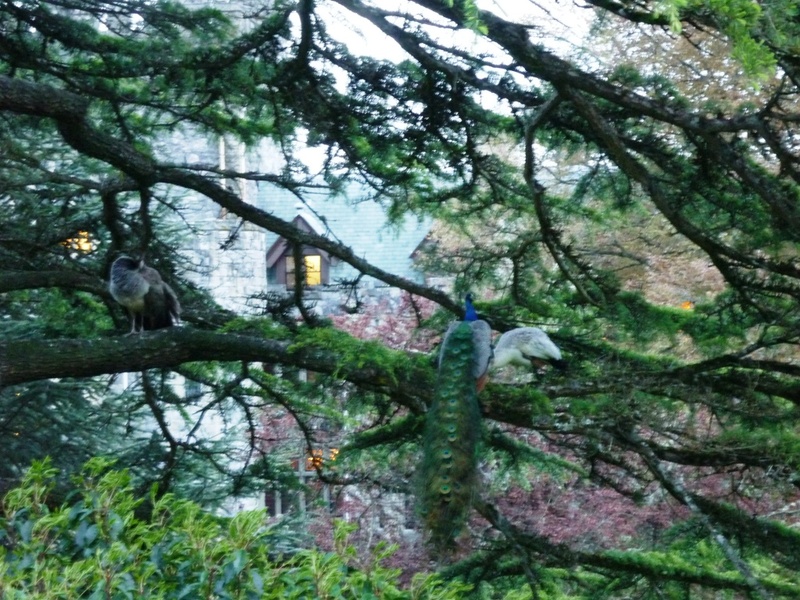 Male and female peacocks in a tree, Royal Roads University. I’d been warned in the confirmation email for my stay in the campus dorm that, during mating season, the peacocks can be noisy at “inconvenient” hours, and that some earplugs might be in order. Honestly, my upstairs apartment neighbours have inconvenienced me more. Over the four days, I became obsessed with the peacocks, following them around like paparazzi and trying to discover something of their habits. They seemed to have specific parts of campus they favoured most, although excretory evidence – if not the birds themselves – could be found anywhere. Playing the role of zoologist, I also came to note differences in the calls of different birds – differences in tone, pitch, the number of consecutive calls, and whether or not calls were preceded by a resonant, goose-like honk. I tried to discern the peacocks’ moods from their calls – whether they did so out of aggression, boredom, to make their presence known, or in praise of equally loud noises, like revved car engines, people laughing, or once, me blowing my nose. But I couldn’t tell, largely because I could hear no real difference among any one bird’s set of calls: those I heard at 5:00 in the afternoon sounded identical to those at 9:00pm, and those at 3:00 in the morning. Yes, 3:00am. And one bird – dubbed Alan – liked to hang out below my dorm room window, six storeys down. 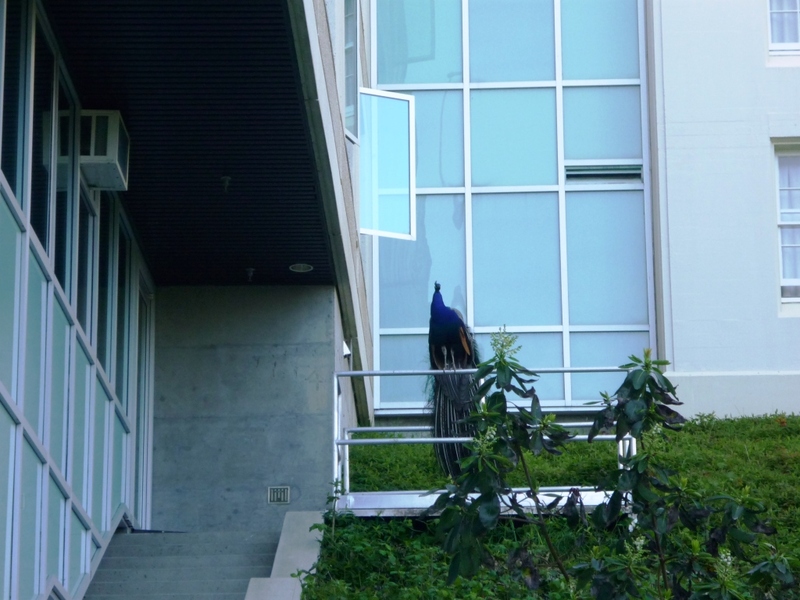 Alan the peacock on his favourite perch outside Millward Residence, Royal Roads University. Still – my upstairs neighbours…. But this is a post about positive things. The most positive occurrence of all being that I was able to find, among other types, a discarded male tail feather. Not one of the “eyes”, unfortunately, but still an impressive one with its metallic green sheen, and fact that it measures some 4 feet in length! 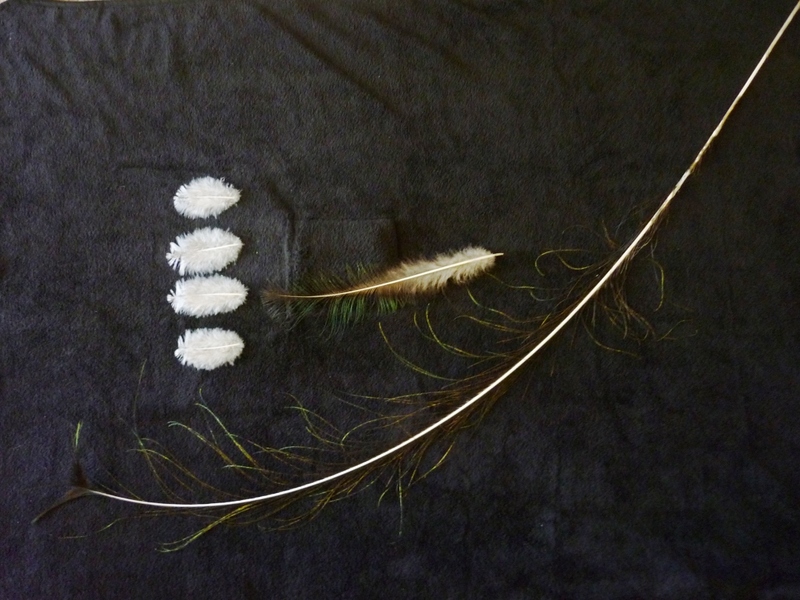 Found peacock feathers from Royal Roads University. I’ve been a feather collector since I worked in Canada’s national parks, and this most recent find is definitely the pride (ha ha!) of my collection, and the highlight of a challenging week. 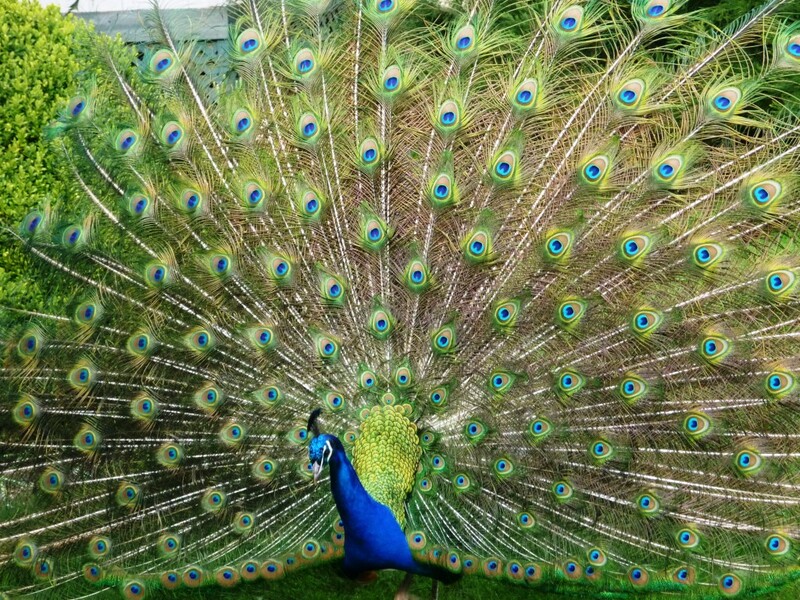 Male peacock in mating display, Royal Roads University. Do you like islands? If yes, which is your favourite? What’s the best or worst thing that’s ever happened to you on an island? Tell me about it in the comments. This entry was posted in Travel and tagged Castles, Gardens, Inspiration, Islands, Peacocks, Positive thinking, Waterfront views. Bookmark the permalink. ← In Case of Fire, Save Writing! Very cool pictures! They are impressive birds. And they are LOUD! They have some in Queens Park and many years ago they used to roam free in the Stanley Park Zoo. I like that you tried to figure out the various calls. 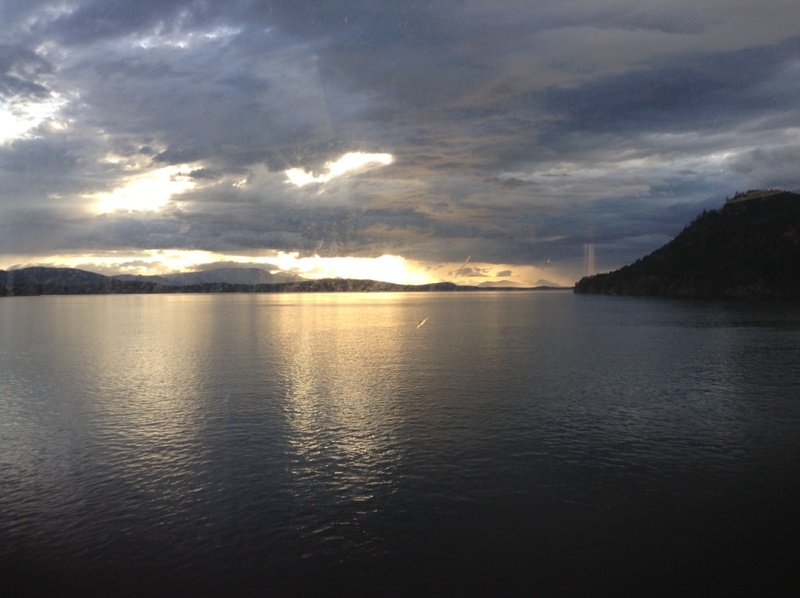 As for Islands…I like them. It is true, however, that the more secluded the island, the more eccentric the people that inhabit the place typically are. Hope you enjoyed yourself regardless. See you soon. I also looked them up on Wikipedia and discovered that the Hindu god of war has a male peacock for his mount. Which is unusual, but also kind of cool. Talk about riding in style! Such pretty images. My grandmother used peacocks as alarms..like doorbells. She was always out in the yard, the garden, the barn, or the fields. The peacocks would scream whenever anyone drove up. Sounds like she was able to guard the house and beautify the yard all in one go! Say, isn’t England part of an island? You enjoyed that. Right? About a half-hour from my apartment is a place called Grounds for Sculpture that has peacocks running around everywhere. Last time I was there, a couple summers ago, a socially outgoing male was putting on quite a display for some females, strutting around, clacking his tail feathers, and making a general racket. I was impressed, but the ladies were not. Join the club, pal. Also, a former band mate used to live out in the sticks of western NJ and I had to drive past a farm to get to our practice sessions. This farmer kept a lot of unusual animals, including llamas and peacocks, some of which had no compunctions about running into the road. I almost flattened a peacock more than once driving past that place. I did enjoy my trip to England for the insight it provided into my WIP. Yet, I was also extremely sick while I was there (and uncertain what my options for seeking health care would be), which is the reason I didn’t make it up to Yorkshire like I was supposed to (I wouldn’t have forgot to go if I weren’t so sick). Also, hardly anybody talked to me while I was there. When I complained to my uncle about it, he said it was due to the tacit class system that still exists there, and the fact that I was backpacking making me seem poor. The female peacocks didn’t seem too interested in the males at Royal Roads either. I was actually hoping to witness some sort of reaction, if not full-on mating (sorry, I used to be a biologist; stuff like that interests me) but no such luck. Those peacocks are impressive and healthy. You can get pretty crummy, listless colonies as well – but you probably know that Janna. Yes, islanders can have peculiar traits. These are being diluted over time though through immigration and travel. Some take longer than others. Some years ago I was in neighbouring Guernsey with a pub games team from Jersey. 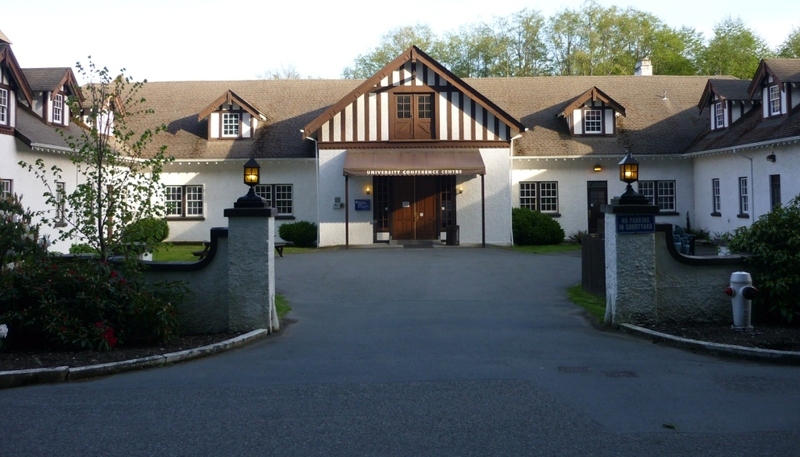 We were quiet and friendly and were given a great night by our counterparts in a country inn playing darts, cards, pool etc. But there was one group of old men who closed ranks and would barely acknowledge our presence. Old feelings and rivalries die hard. Some take longer than others. Probably the reason why smaller islands seem a bit odder than larger ones: not enough immigration, visitors, or general exposure to the wider world.